Here will open is a series of works that include shop window installations and workshops. It has been realised in different forms in Helsinki and Turku, Finland, Christchurch, New Zealand and Barcelona. The work derives its topics from ongoing public discussions specific to the context of the site. It makes suggestions for alternative uses of commercial spaces and in this way contributes to the discussions around urban planning and the relationship of public and private space. The installations mimic shops in transition from one operation to another. The papers in the window during renovation and an advertisement for the future function of the space create a realistic setup. This kind of setup is not something we usually start to doubt about immediately. It has turned out that people read the advertisements and automatically accept them as part of the reality. It is only afterwards when they start to think about what it means and try to come up with some kind of theory to explain it. The text in the window indicates a fictitious future function for the space. 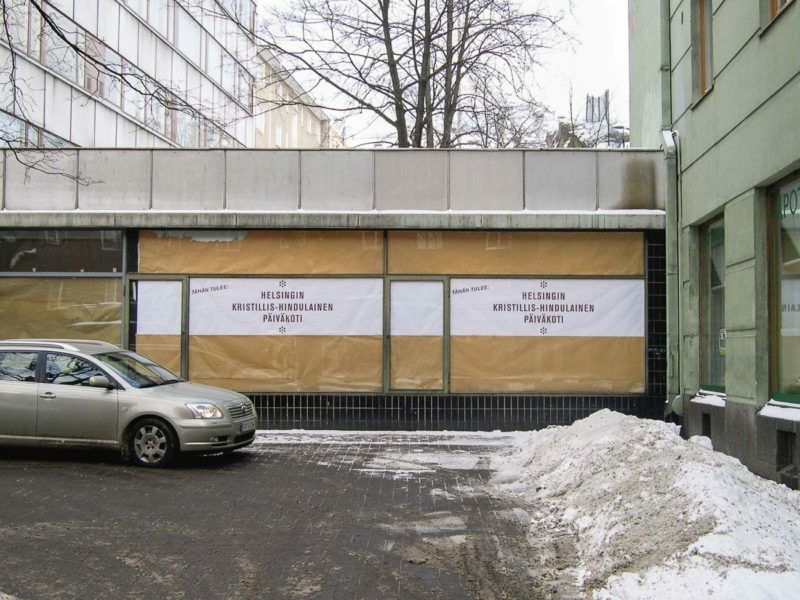 It says in English: “Here will open: Helsinki Christian-Hindu day-care centre” and it relates to a recent public debate about Christian values, child raising and alien influences. The debate started when the Finnish minister of culture was planning a Christmas holiday in the village of Mother Amma in India with her family. This raised a charged discussion about good Christian values versus some “strange” Hindu influence. The work generated lots of public reactions; most people were doubtful or even angry and wanted to question the possibility of such an institution. But there were also some that were really enthusiastic and wanted to sign their children in the new day-care centre.